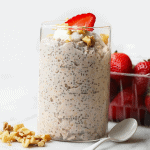 These Strawberry Vanilla Overnight Oats are a breakfast meal-prep miracle! All you have to do is throw all of the ingredients into a jar, let them sit overnight, and an easy and delicious breakfast is ready for you in the morning. 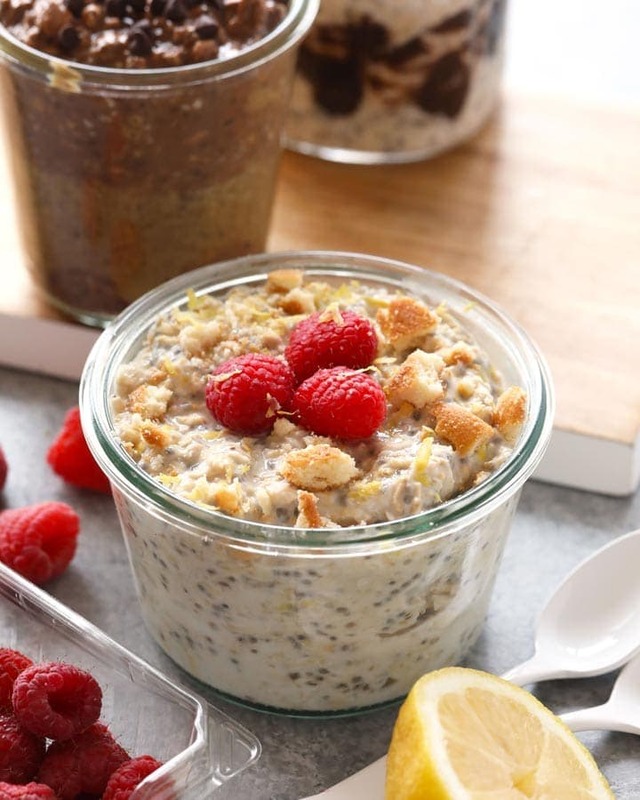 Not only are these overnight oats tasty, but they are packed with fiber and protein to keep you satisfied until lunch! You may not know this, but I eat oatmeal EVERY SINGLE MORNING (unless it’s the weekend). Oats + Banana + PB is my favorite combination. During the warmer months, I like to mix it up and eat Overnight Oats, but soaking my oats in a liquid such as almond milk, Greek yogurt, etc. I like to mix Greek yogurt and almond milk for my liquid. 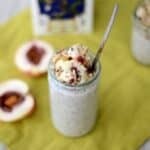 I have found that using rolled oats gives it a much better texture. 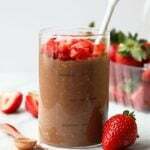 Chia seeds make everything better and add a healthy dose of Omegas to your meal. If you don’t use sweet almond milk or a flavored yogurt, I suggested a few teaspoons of honey, but that’s just my preference! This time around. I decided to bring strawberries center stage and puree them with Greek yogurt and almond milk. Almost like a smoothie. When making overnight oats, I also try and keep the 2:1 ratio of liquid to oats. I am a toppings girl. I love mixing textures. On top of this guy, I added sliced banana, strawberries, and chopped pistachios. I’d say that this recipe serves 3 IF you plan on loading the toppings like I do. If you aren’t a toppings person (do they exist?! That’s the best part)- you could probably just split this recipe down the middle. First, blend Greek yogurt, almond milk, honey, and strawberries together. It will look like a strawberry milkshake! Next, place the mixture into a medium-size bowl and mix in 3 tablespoons chia seeds and 1 teaspoon of vanilla. Then, mix in rolled oatmeal. Place in refrigerator overnight or for at least 2 hours. Top with your favorite toppings and enjoy!